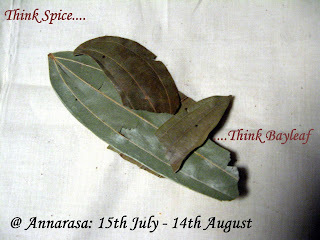 This month I am hosting Think Spice..... This event in the foodie blogosphere was thought up by Sunita of Sunita's World. It aims to bring spices - those lovely fragrant, pungent, vegetable based substances that made the world go round - centre stage! Bayleaf is the spice of my choice this month and I invite all you food bloggers and food lovers out there to join me in celebrating its contribution to global cuisine. Create and post your favourite and/or most delicious recipe that features the aromatic bayleaf as a key spice. You can use it in any form you like - whole in the form of pieces or leafs. The dish can be spicy, savoury, or sweet, but one should get a sense of bayleaf is what makes this dish special. Email the entry to me at: annarasa@gmail.com along with your name, name of your blog, name of your entry, the url link to your entry, and a short description of your creation. 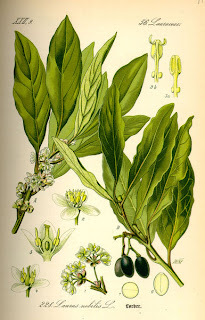 You can share any facts you have learnt about bayleaf, your ideas, and thoughts about it and its uses. Let us know if bayleaf is a part of your spice cabinet or if this is the first time you decided to give it a try! Do you use bayleaf only for cooking or do you find it useful in any other way too..... the possibilities are endless. I do have one request though. 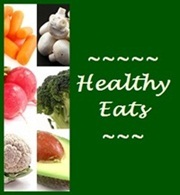 This is a vegetarian blog, and so I would be happy to welcome all vegetarian recipes. This event runs from 10th July 2009 - 9th August 2009. You can send in as many entries as you like to this event. You can send in recipes that you might have submitted to other events also. 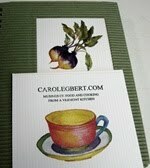 Any recipes from your archives can be accepted ONLY if they are updated and re posted especially for this event. Please do not send in links to an old post. Non-bloggers are welcome to join in. Just send in your recipe to me with a photograph if you have one and all details mentioned above, and I will add it to the round-up. If you would like your foodie colleagues and friends to know where you are located, you can add your City, Country to your entry. This is entirely your choice. It would be lovely if your entry is accompanied with a photograph. Preferred size of photograph: 350 pixels wide. As mentioned above, do describe your creation - just a couple lines telling us about the recipe you have chosen to enter into Think Bayleaf this month. 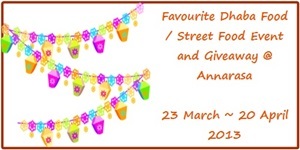 And don't forget to link your entry this announcement and to Sunita's blog @ Sunita's World. I have created a badge for Think Bayleaf. Show it off on to your post. This is the last in the roundup series for MLLA 12. Thanks for participating and making this event such success :) I hope that I have not forgotten anyone, but if you don't see your entry here, do alert me via email asap. I plan to announce the winner of MLLA 12 in the coming week!! Shaista @ Mixcalculations is a new food blogger. Her entry is Arhar or Toor Dal. She says that she loves having variety of daals, with roti or rice or just as it is. 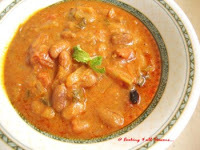 Toor daal is one legume that which she cooks most often. It is super easy to make, nutritious and saves time if you are in a hurry. Jaya @ Jayaspace is also a newbie to the blogging world. She writes: "I have grown up eating various beans -- moth, moong, black eyed peas... Love them for their taste and nutrition and cook them at least once a week in my house". Though this is a very simple and very common recipe, Jaya says Moth/Matki Usal can be adjusted for taste depending on the garnish and level of spice used. Meeta @ What's For Lunch, Honey? has dished up Butter Beans and Leeks, which she has adapted from one from Jamie Oliver’s - Cook with Jamie! Meeta says: "These beans and leeks go with just about anything. Fish lovers will find it perfect to trout, wild salmon or tilapia. Delicately baked chicken is with just a simple seasoning of lemon juice, salt and pepper is a wonderful accompaniment. Or as Jamie serves the beans and leeks with steaks". Jisha @ Kerala Recipes Long Bean Stir Fry (Achinga Mezhkkupuratti in Malayalam) sent in a wonderful recipe of tender long beans stir fried in oil! Jisha says these beans are a favourite with her husband and she prepared this simple yet tasty dish for him. 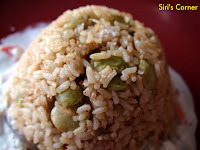 A wonderfully innovation rice dish comes to us from Siri @ Siri's Corner! Butter Bean Pulao is a quick and esy recipe, and it is needless to say rather tasty. Siri picked up this idea from a colleague at work, and tried it at home with great success. 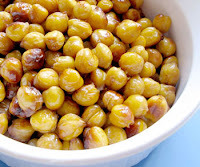 Katie @ Eat This a lovely snacking idea - Roasted Chickpeas! Crunchy roasted chickpeas are a delicious snack filled with protein. Katie writes that the same can be done with black, kidney and pinto beans!! Nivedita @ Nivedita's Kitchen has sent in a protein powerhouse for MLLA 12. She writes 14 Mixed Pulses Gravy "is a very healthy food for all ages, especially children. And can be used as main food with chapatis or side dish or an evening snack". Location ; Hubli, Karnataka, India. Ann @ Happy and Healthy Cooking send in a simple curry recipe - Satvic Tuesday. Ann notes that Dried peas are excellent source of protein and fiber. To maximise on their nutritive value, Ann tried best to keep this recipe healthy and simple. She cooked the legumes in a Satvic style to aid in good digestion! Matt Huntley writes: "As summer quickly approaches, the idea of eating a warm and hearty soup seems to steer a lot of people away from utilizing beans in their everyday diet. Because they are so easy to add to any soup or stew, it is easy to forget that beans can adapt just as well to chilled dishes. This recipe features the “earthy” flavor of Blackeye Peas with fresh vegetables, and is tossed in a delicious tangy and spicy dressing". 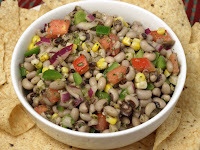 Cowboy Caviar can be found @ @ the Hurst Bean Blog. Susan from The Well-Seasoned Cook sends in her own recipe Pinto Beans Flameado! Susan writes that "the traditional recipe is known as Queso Flameado (Flaming Cheese) and is doused with brandy and torched before serving". Watch out for the smoke detector in your kitchen if you want to try this one. Shri @ Tastytouch made delicious deep fried lentil dumplings or Dahi Vada! Shri says her Grandma made the best vadas she has ever tasted. 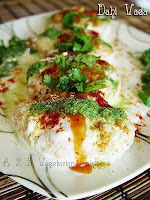 The ideal Dahi Vada should be soft, and spongy, and soaked in seasoned yogurt. Miri from Peppermill made a Chawli Amti for MLLA 12. Amti is a traditional recipe from the state of Maharashtra, India. "Amti" refers to a lentil curry and is one of the staples served with rice or rotis. Miri says: "This particular recipe uses legumes - I have used black eyed peas, one can also use black chickpeas - sprouted even!. The dried coconut and garlic adds some lovely flavours to this curry"! 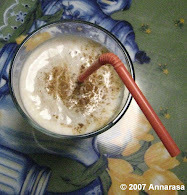 All text and photographs in this blog, unless otherwise noted, are Copyright of © Annarasa 2007-2009. All Rights Reserved. Kindly do not reproduce without permission. 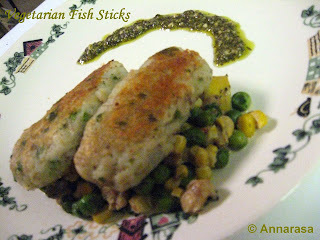 I kick off the MLLA 12 Roundup this morning with 5 further entries from Sadhana & Muskaan of A2Z Vegetarian Cuisine! 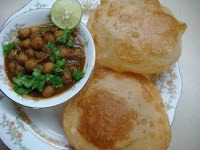 The first is Jain Chole Puri. Muskaan writes that while Chole Puri is everybodys favourite a Jain style Chole Puri is more 'Saatvik' as Potatoes, Onion, Garlic..etc... are not added to it during the cooking process. She notes that Jain chole tastes awesome, the food is low in Saturated Fat, and very low in Cholesterol and Sodium. This meal is also a good source of Dietary Fiber, Protein and Copper, and a very good source of Folate and Manganese. an Omelette sandwich!! She uses none other than chickpea flour to make these delicious looking omelettes. 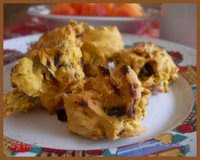 Muskaan writes that ChickPea Flour (Besan) is also low in Saturated Fat, Cholesterol and Sodium. It is also a good source of Magnesium Protein, Folate and Manganese, and Niacin. Tomato Cabbage Omelette Whole Grain Sandwich looks an absolote treat. Muskaan also made Dahi Vada (Lentil Dumplings In Sweet Yogurt Sauce for MLLA 12. 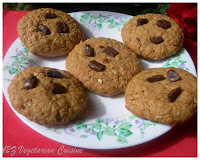 The following 2 are from from Sadhana is Oats Peanut butter cookie. On their blog, Sadhana notes that peanuts are not true nuts but a member of a family of legumes related to peas, lentils, chickpeas and other beans. They are in fact a very good source of monosaturated fats, the type of fat that is emphasized in the heart-healthy diet. 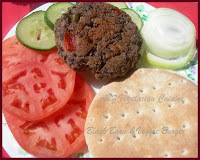 Sadhana has also made a healthy Black Bean Veggie Burger. 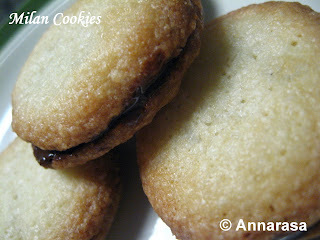 To know more about these delicious cookies and the burger, visit their blog A2Z Vegetarian Cuisine! Divya Vikram @ Dil Se.. sends in a lovely third entry for MLLA 12. 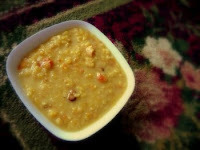 It is the yummy Moong Dal Payasam. Divya writes that this is a healthy dessert made with moong dal and jaggery. It is usually prepared on special occasions in South India. Lubna's fourth entry is Capsicum Chana Dal Curry. 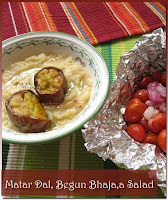 Do take a peek at her blog Yummy Food for this recipe! 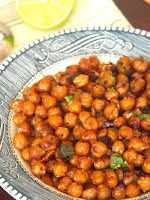 Sweatha @ TastyCurryLeaf blog shows us another way in which the tasty and nutritious chickpea can be used in cooking! Her entry Moroccan Spiced ChickPea Spinach Soup. Sweatha says: "I tried this soup as the original recipe included apricots in the soup which sure add a tanginess. A Hearty and filling and perfectly spicy soup. Chickpeas in soup and sauce form is very welcome and healthy". Ramya @ Simple Vegetarian Recipes hs sent in Beans Paruppu usili /Beans with cooked Toor Dal This is a side dish and the main ingredient is the widely used legume which is toor dal mixed with beans. Bee and Jai @ Jugalbandi have sent in Papad Palakfor MLLA 12.They write: "This dish was inspired by the Gujarati Dal Dhokli, where wheat dumplings are added to a lentil base. This is easier with ready made lentil wafers (available at any south Asian grocery) added to greens as they wilt down. Lower in carbs and much quicker. Frozen, thawed spinach will work too". MLLA 12 must set a record of sorts with the number of delicious chickpea recipes it has received!! Here's to yet another helping of yummy legumes. Pooja @ Experiments in my Kitchen loves cooking and has polished her cooking skills in the last few years. She chose Chana/Chickpeas Curry for the MLLA 12 as they are her favourite protein packed legume. This Chickpea Curry is prepared with a blend of spices and is sauteed. It is usually enjoyed with batura or poori - Indian style fried breads. Poornima from Tasty Treats is enjoying relaxed July 4th weekend. As a treat she has also prepared a recipe that she got from a friend's mother. 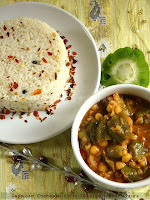 Do visit her blog for a delicious Chana Masala recipe. Prasu has made a very different and unique dish for MLLA 12. Its a Brussels Sprouts Curry. She likes the high nutrient value of the Brussels Sprouts and has added chickpeas to the same to give you a power packed idea for lunch! Prasu writes that pulses, including chick peas, are increasingly being used in healthy diets in order to promote general well-being and to reduce the risk of illness. In fact, chick peas are an excellent source of protein, fibre, complex carbohydrates, vitamins and minerals. Lubna's third contribution to MLLA 12 is Vada - A South Indian Lentil Doughnut. Lubna finds that cooking with family and friends is a definite stress buster and suggests you try it at your next free weekend. Visit her blog Yummy Food for more yummy treats. Jessica @ the Fearless Kitchen made a refreshing Black-Eyed Pea Salad. Jessica says that this is a "pretty simple but tasty Greek dish that can work either as a side dish or as a main dish". She adapted the recipe from Susanna Hoffman's The Olive and the Caper to treat her open House guests one Sunday in June. Bong Mom from USA @ Bong Mom's CookBook has sent in two recipes. The first is Mator Dal (Yellow Split Peas), and the second is Mator Dal with veggies (Yellow Split Peas with vegetables). She says that these are her two favourite recipes for dal made of Yellow Split Peas. They are like an Indian style soup and the original name is in Bengali. Rupali @ Chakh...Le...Re! loves Mexican food, especially the salsas. She created a delicious Indian style salsas to go with an all time favourite Indian tea-time snack. 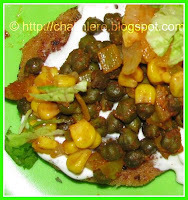 Find the delicious recipes for these salsas on her blog post Potato Patties with Desi Salsas. Deepti from Dipskitchen made a mouthwatering Lobhiya( Black-eyed beans) chaat. Deepti notes that this dish is basically a healthy snack as it contains lobhiya which is a source of calcium, folate and vitamin A.
Srivalli from Cooking 4 all Seasons rekindled fond childhood memories by preparing a Gujarati style Rajma Masala. Looks yummy and I am sure it will do justice to any rice dish or freshly prepared Indian style bread!! Mia @ SWAADU made Snowpeas and Sprouted Green Gram Upperi. Mia writes that this is a dry curry which is made with sprouted green grams and snowpeas.What makes it special is its color and the nutritious value.This is simply a soothing and comforting dish which goes well with rice or chapathi or just like that as a salad. More of the roundup to follow tomorrow!! Rachel @ The Crispy Cook came across a recipe for some chickpea munchies while reading Ashley Miller's "The Bean Harvest Cookbook". She adapted the recipe to create a spicy, healthy snack, which would go especially well with an iced drink or a glass of wine. Try Spicy Roasted Chickpea Nibbles with your favourite drink this summer! I think they go rather well with cup of tea too! Crunchy Garbanzo Beans have also been on Manali's mind for some time. She says this crunchy snack is guiltless, as it is oven baked. It is also very simple to make, easy to store and will be a hot favourite with the kids. Find her recipe for this anytime treat @ Cravings. Divya @ Dil Se.. has prepared 2 wonderful recipes for MLLA 12. The first is Tortilla Bajji - which is a fried fritter made by deep frying tortilla chips in a batter made with gram flour and rice flour. The second is Urad Dhal Vada. Divya says Urad Dal Vada makes a great appetizer just by itself with coconut chutney. You can also dunk these beauties in sambar, rasam, or curd - each version tastes simply divine. Preeti from Shail blog writes that "Dal Paratha is a traditional dish of northern India and is mostly prepared during the time of festivals". Preeti prepared Stuffed Dal Paratha and Strawberry Kheer as a Sunday breakfast treat!! Very festive. 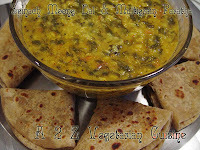 Pooja @ My Experience With Cooking sent in an inviting recipe of Moong Dal Thoran. She says that this Thoran is a protein packed side dish. Whole moong dal is stir fried along with ground coconut mixture and few spices to achieve a delicious simplicity. Sadhana & Muskaan too have sent in multiple entries for MLLA 12. Sadhana loves foods prepared with besan - you wonder why - visit her @ A2Z Vegetarian Cuisine to know the answer!! Their first entry is Baked Pakoda(Healthy Bengal Gram Flour Snack). For their second entry, Moong Dal With Spinach Muskaan writes that they love moong dal, as it has low glycemic index, it is easy and fast to cook, the spinach has added health benefits, and the kids like it too. This dish goes very well with my multi grain Paratha and Rice. Palak Dal is also something Shabeena remembers from her Mum's home cooking! A tasty and nutritious dish - join Shabeena and her attempts at recreating this lovely recipe at Shab's Cuisine. Soma @ eCurry writes that Fried Chickpeas or Ceci Frito is a classic Italian fried starter, and is terribly addictive when it is served warm!! She says that these chickpeas are a great snack and are also very similar to Indian style dal eats called Sundals. She recently prepared the fried chickpeas for some visiting friends who were left licking their fingers. Parita from Parita's World loves the taste and versatility of chickpeas. For MLLA 12, she has dished out lovely Chana Masala (Chickpea curry). 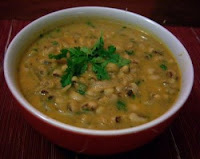 Check out her blog on more of her favourite legume. Oh my!! We are in full-blown chickpea season aren't we?? Can't complain that you weren't spoilt for choices now:) More MLLA 12 follows.